If you've been following the unfolding story regarding the Sears Blue Crew, here comes the last update for a while. However, just because I won't be writing Sears posts every couple of days doesn't mean this is over. Oh far from it. But before I get to that, if you need to get up to speed, click here, here and here. 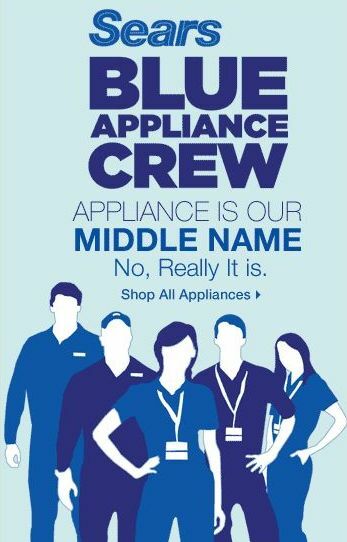 Let me start out by saying that I am beyond impressed with Sears Appliances. I see them in a whole new light. I mean, how many members of the appliance industry would open themselves up to a panel discussion with a group of designers and architects who'd been hand picked by blogger who'd been done wrong? I appreciate the trust of Mike Léger from Sears particularly. I had no intention of having this be a finger pointing session but he couldn't have known that. So hats off to you Mike. Kudos to your whole team and your whole organization while I'm at it. You guys showed me a side to your company I never knew existed. Bravo. I want to thank everybody from the designers and architects panel who agreed to participate in this conference too. So to Kristin, Susan, Kelly, Jamie, Ann, Mark, Rachele, Pam, Richard, Mike, Peter and Alex; I say thanks for your willingness to help turn a frustration into a path to a solution. Our conference call yesterday last for an hour and it could have gone on for a few more if you ask me. This was not a sales job or an attempt to make customers out of us, rather it was an honest request for feedback. We covered a lot of bases and our allotted hour was up too soon. In moving forward from here, we're going to continue to meet and to come up with more ideas and solutions. We have a lot to learn from one another. We work different sides of the same industry. How few opportunities there are for these sides to interact hit me as I was calling into the conference yesterday afternoon. It was good to play a role in providing one. More please! t was pretty great all around Kelly. Bravo Sears! Bravo Paul for getting this ball rolling - what a unique opportunity for designers and architects - one that I'm sure doesn't come around every day. And how great does it feel to be part of a solution - on both sides! Thanks Donna, it was a great opportunity to do something constructive with my frustration.